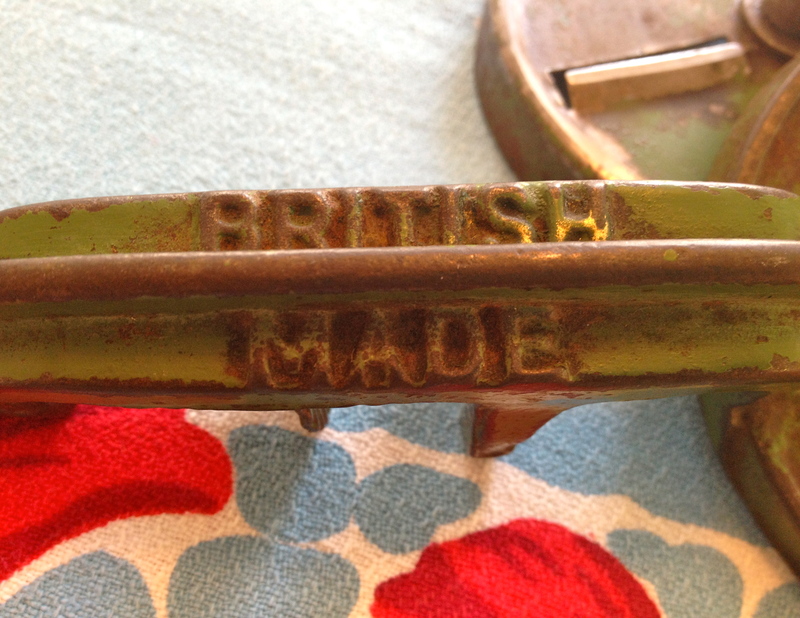 It’s old, it’s cast iron, it’s green, it’s . . . what is it? I just found a kitchen tool that was so caked in dirt that it was hard to tell what it was. But I could tell that it was cast iron, that it was green, and that it was certainly old. It took me twenty minutes of careful scrubbing to get the gunk off the cast iron without also removing what remained of that wonderful green paint. Sorry that I don’t have a “before” picture. 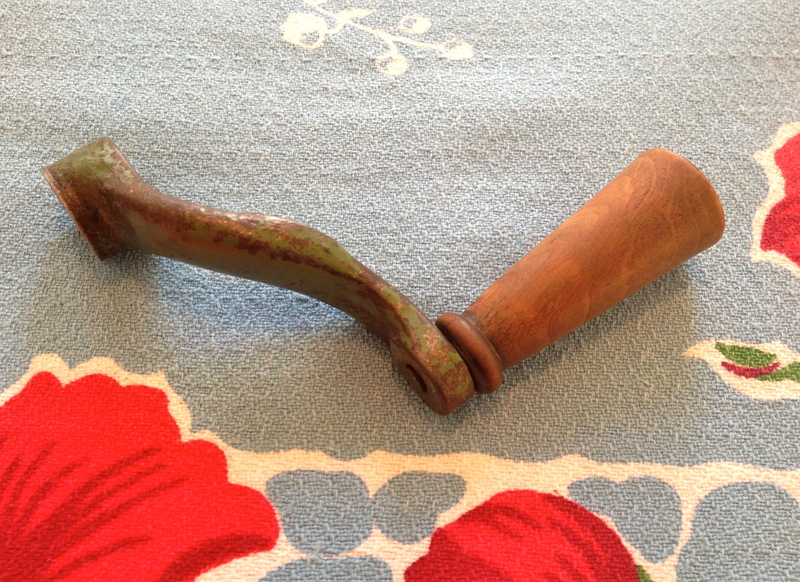 First, a crank with a silky polished wooden knob. 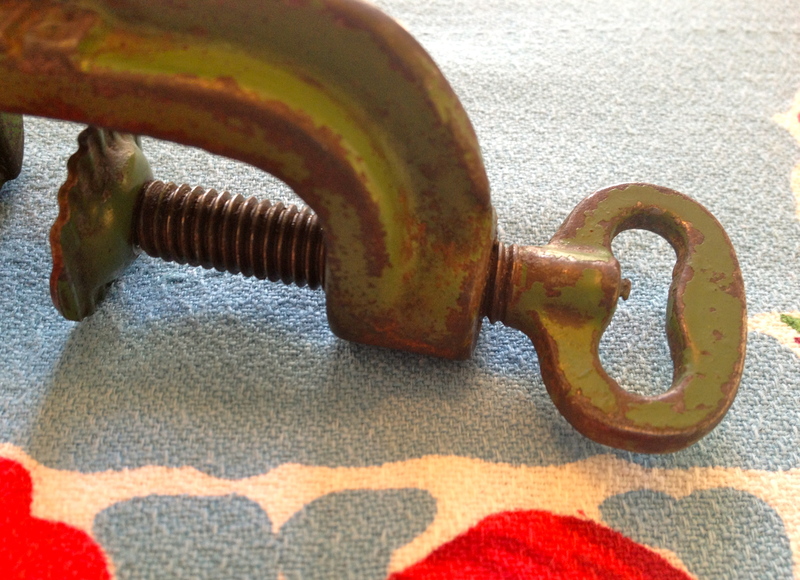 I love that little wooden flange that keeps your fingertips from rubbing against the crank. A very thoughtful design detail! Then a smoothly-machined steel cutting plate with three still-sharp blades. Ask me how I know they’re still sharp. Then we’ve got the cast iron body of the tool, sporting a molded-in funnel that fits against those sharp blades . . .
. . . and a lovely little iron thumb-turn to hold the tool steady on your tabletop. Isn’t that shape just the nicest? Another beautiful design detail. So what is it? 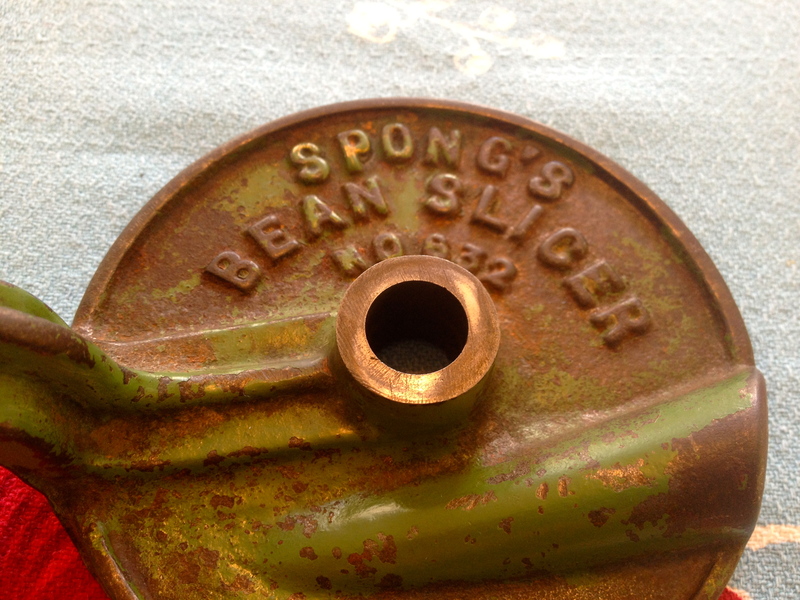 Well, if you guessed Spong’s Bean Slicer No. 632 . . .
. . . you’re right! What’s more, it was made in one of my favorite places. You can see traces of the original gold paint on the letters. This was quite a fancy gadget when it was new! This tool is probably close to a century old. You can easily imagine it in the kitchen at Downton Abbey! 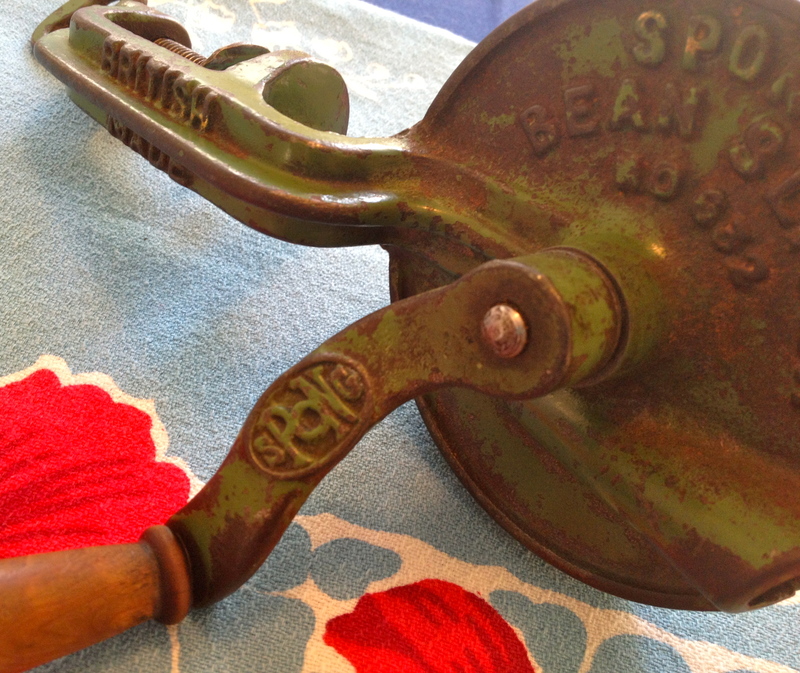 Newer Spong’s Bean Slicers are easy to find on ebay and etsy, but they’re more cheaply made. I’ve seen newer ones with boxy proportions, plastic knobs, and thumbturns made of thick chrome-plated wire. Functional, yes. Well-designed and sculptural, not so much. The quality of modern cast iron just isn’t there anymore, too. Compare any vintage cast iron skillet with a modern one—the vintage one will be smoothly polished and finished like this bean slicer. The modern one will look crude and unfinished in comparison. Another reason to buy vintage. As if you needed one! So how does the Spong’s Bean Slicer No. 632 work? 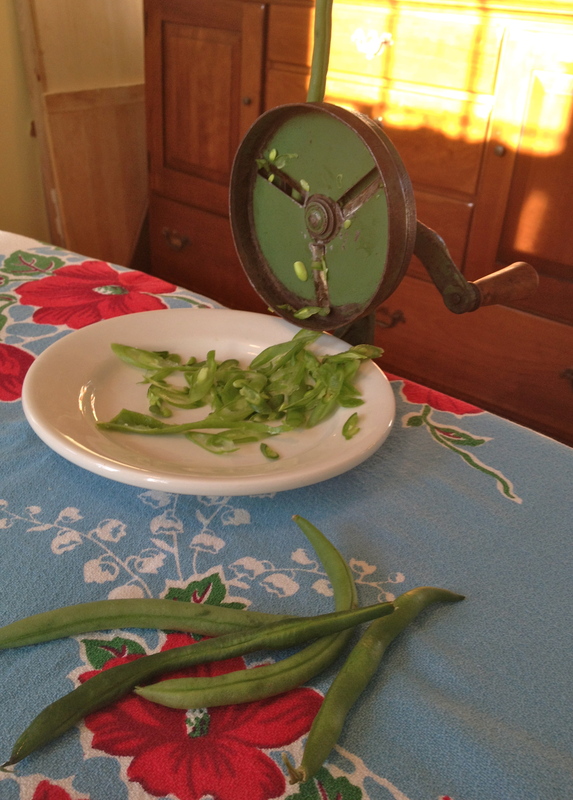 Pop a green bean into the funnel and turn the crank . . .
. . . and out come diagonal bean slices onto your vintage Buffalo China plate. In no time flat, and without a spark of electricity, you’ve got a pile of beans ready to be cooked. Green beans on a blue 1950s honeycomb-weave tablecloth with big red hibiscus flowers! 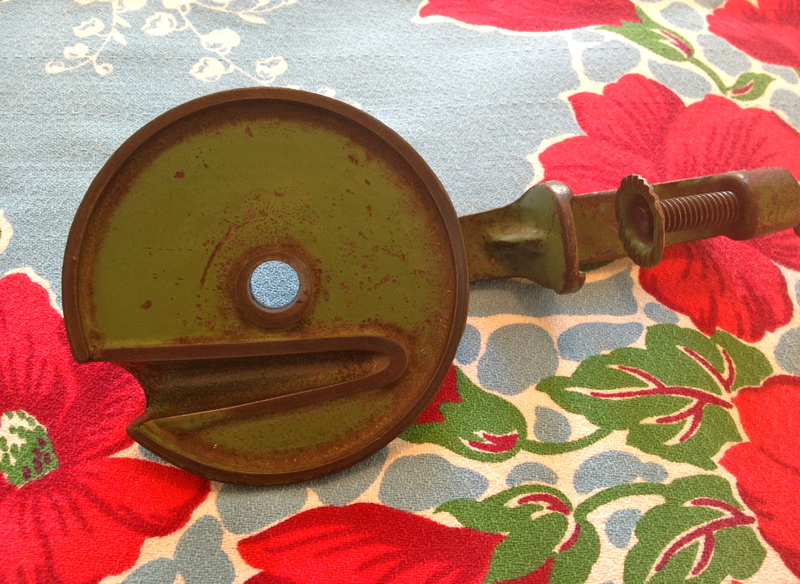 What interesting old kitchen tools have YOU found lately? I found one of these recently too and plan on growing “slicing beans” (yup, they are thing) next summer. Old kitchen tools are the best! Jennifer, what does yours look like? Same green? or different? Handy dandy tool and loved that you demonstrated it. Have been watching Downtown Abbey in the studio..never seen it before and catching up on past seasons. Good crafting entertainment. I admire your multitasking skills–I can either paint furniture or watch TV, but not both. And since I have lots of furniture to paint, Downton Abbey will have to wait. I think I’m thirty seasons behind, give or take a few. When I saw the handle, I thought for sure it was going to be a grinder like my mama used to use. 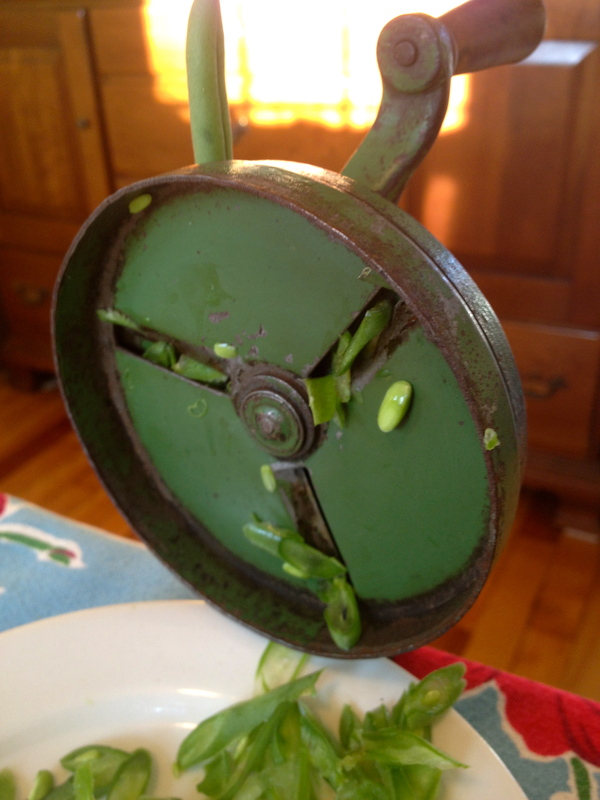 I have never seen a bean slicer–very interesting, and a great reveal! I’d never seen one either! I was surprised when I finally cleaned the gunk off enough to read the lettering. 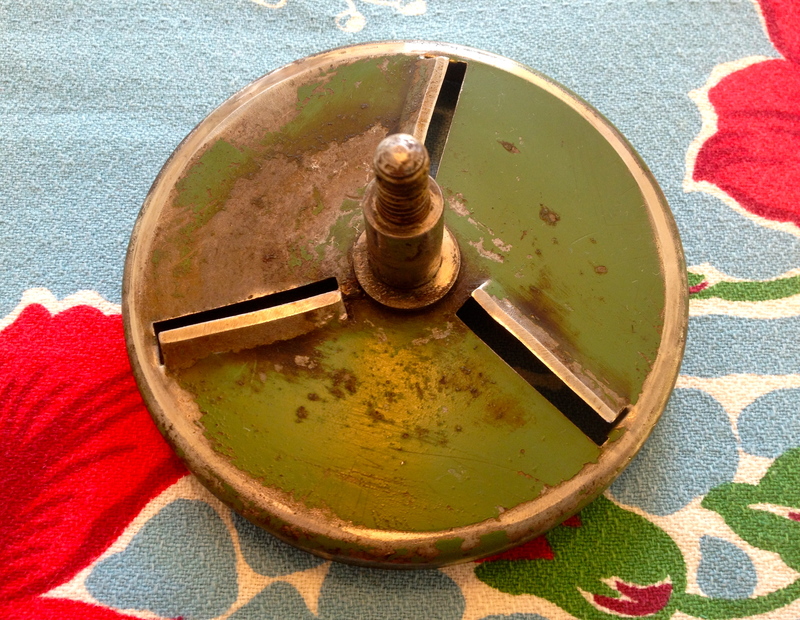 A vintage food processor! And the little chunks are nice and uniform. If only it could make 15-second pie crust like a Cuisinart. Ha! Yes, a food processor!